In the summer months, you will most often find me in dresses and rompers. They are easy, light, airy and effortless which is the perfect recipe for a summer day! I was browsing one of my favorite stores the other day and initially saw a pair of shorts in this print but didn't love how they fit. 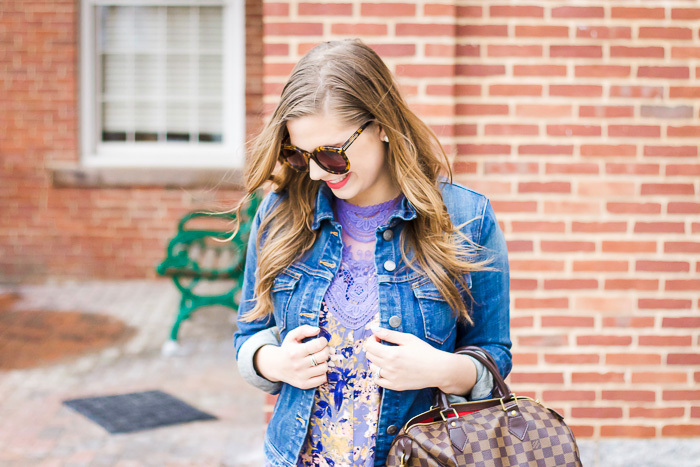 Then I stumbled across the same print in a romper with this beautiful lace detailing. I was instantly sold. I love the colors, the unique high neck line, and the open back! I can't wait to wear it in the summer with sandals or wedges! So the outfit is incredible. You always have the best looks.... but your photography is NEXT LEVEL!! wow! Super cute girly. Love your style! This romper is seriously SO cute!!! Love the look beautiful lady! !